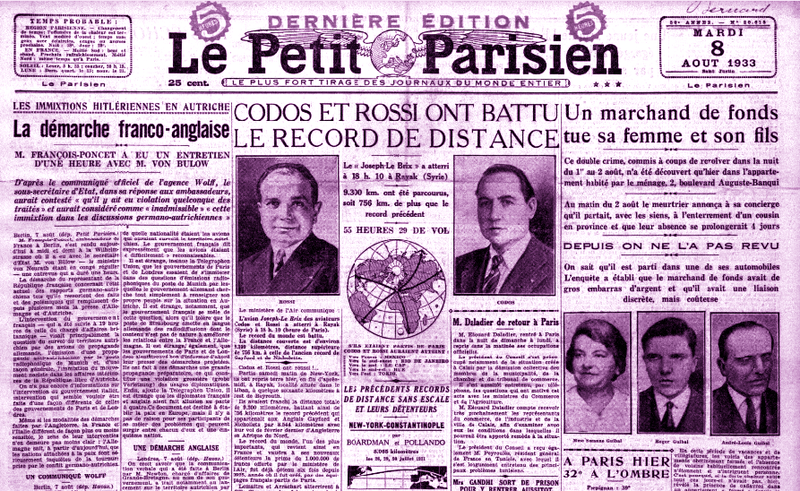 Report from Le Petit Parisien, December 6, 1933. The Aero Club of France celebrated yesterday evening, at a banquet given at its local hotel on the rue Galilée, Lieutenant Rossi and Paul Codos, the record breaking aviators. Mr. Pierre Cot, Minister of Aviation, chaired, having at his sides the two heroes of the raid, along with their wives and Messrs Delesalle, Under-Secretary of State for Aviation; Gaston Menier, Chairman of the Aviation Group in the Senate; Paul Perrin, President of the Aviation committee in parliament; Admiral Dumesnil, Colonel Lahm; aviation representative of the United States; Messrs. Soreau, vice-president of the Aero Club; Bossoutrot, Bleriot, Lacoste, the engineer Zapata. Mr Henri Potez, President of the association Chamber; Allègre, Administrator of Air-France; Watteau, President of the Aeronautics League, etc.